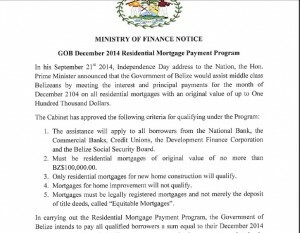 On Tuesday, government announced that it was going ahead with a Residential Mortgage Payment Program it had first announced in September to pay interest and principal payments for mortgages for the month of December, 2014. Tonight, there is further information provided in respect of the program that involves mortgages with an original value of up to one hundred thousand dollars held at the National Bank, Commercial Banks, Credit Unions, the Development Finance Corporation and the Belize Social Security Board. 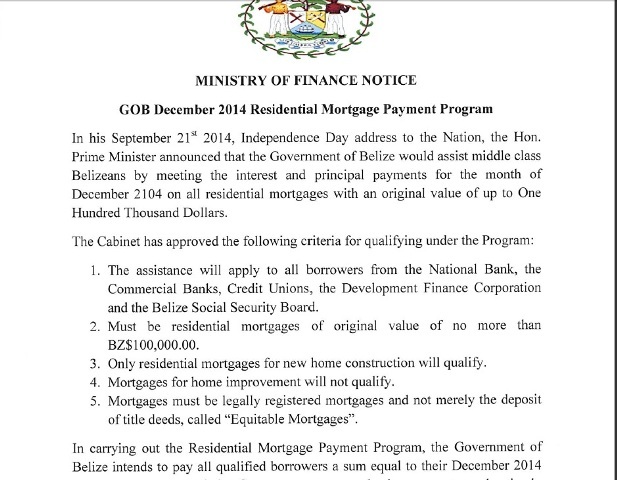 A release from government today clarifies that the program also extends to mortgages taken out solely for the purpose of refinancing prior mortgages for the construction of new residences. Also qualifying are residential mortgages for new home construction.